Following lengthy debate, the President signed a bill on Monday focused on boosting credit availability for small businesses and encouraging near-term capital expenditures. While credit availability improved markedly for large companies in recent quarters, lending loosened only modestly for small businesses, limiting the economic expansion. The Small Business Jobs and Credit Act of 2010 will establish a $30 billion fund earmarked for small business lending. The bill also provides $12 billion in tax breaks and incentives for small businesses, including accelerated depreciation of new equipment and various tax exclusions and deductions to encourage growth. The new bill should improve liquidity for small businesses and increase capital spending, at least temporarily, potentially boosting hiring across the broader economy. The index measuring small business optimism ended August at 88.8, up 0.7 points from July but still on par with levels recorded one year earlier. The reading remains down 7.5 points from the onset of the recession three years earlier, indicating small businesses are still concerned about their prospects. Aside from uncertainty regarding tax policies and credit markets, which the legislation may help quell, 42 percent of businesses cite poor sales and weakening profits as their primary challenges. These companies’ limited confidence in the recovery will reinforce cautious hiring plans, but increased capital availability and tax breaks could spark a brief hiring surge and some short-term economic momentum. 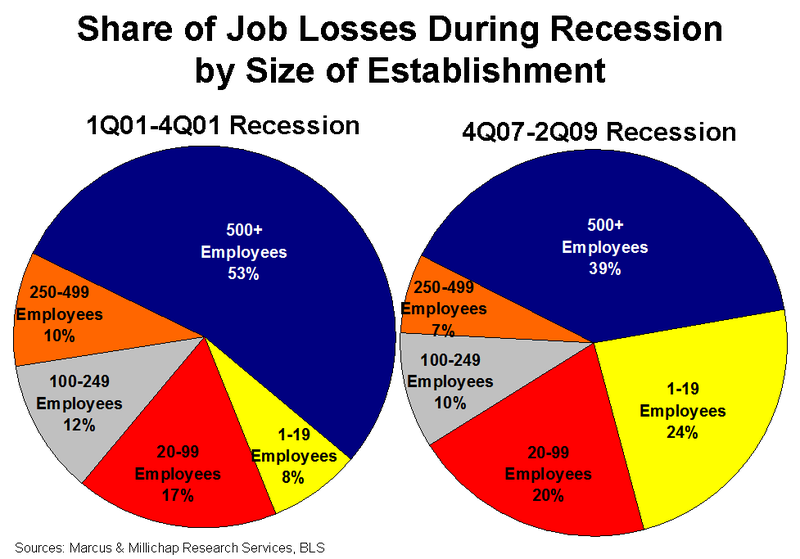 Unlike the recession of 2001, job losses in the current downturn have centered largely on companies with fewer than 100 employees, making the recovery of small businesses crucial to the onset of a self-perpetuating expansion. While large companies have substantially repaired balance sheets and built cash reserves, smaller companies have lacked sufficient resources to spur growth and support hiring. By offering tax incentives and increasing lending to smaller organizations, the government hopes to spark capital expenditures by many companies that delayed spending through the recession. Though this infusion risks losing traction once the program ends, much like Cash for Clunkers, it should boost the economy over the short term, offering the opportunity for a more natural and sustainable expansion cycle to take hold by mid-2011. The recession has impacted industrial property operations significantly, generating a 370 basis point increase in vacancies since its onset. While these properties appear close to stabilization already, the new legislation should improve absorption in the coming quarters and hold the rise in vacancy during the second half to just 10 basis points, with the rate stabilizing at 13 percent by year end. Providing small businesses with increased access to credit and additional tax deductions on startup costs should encourage limited expansion by smaller retailers. This trend would help stabilize operations at neighborhood/community centers, where vacancies increased 360 basis points over the past three years. Vacancy rates at these shopping centers currently average around 11 percent, exceeding the overall retail market vacancy rate by almost 100 basis points. Rents at neighborhood/community centers reflect the dramatic weakening in occupancies recorded in recent years, with the average effective rate down more than 6 percent from the most recent peak reached in early 2008. This entry was written by marcusmillichap, posted on September 28, 2010 at 10:10 pm, filed under Research and tagged Small Business Credit. Bookmark the permalink. Follow any comments here with the RSS feed for this post. Trackbacks are closed, but you can post a comment.